Wall Abstract Artwork Clock Sculpture Contemporary Hand Painted Red Metal Art. 38" x 24" x 2" (Display size shown, mounted with 1" spaces in between each panel). High Grade rigid Aluminum plate &###xA0;with a battery powered quartz movement. Silver & Jewel-Toned (Fusion of Red tones). Fabrication Methods & &###xA0;&###xA0;Features. The dynamic patterns that appear in this work of art are hand-textured into the aluminum. The highly-reflective qualities are enhanced when exhibited under good track lighting or spot lighting, creating intense depth and highlights that come alive with movement as you view the artwork from different angles. All sculptures and wall art are photographed under vibrant light sources. The greater the light source the more dynamic the conversation becomes. Quartz halogen bulbs are suggested, typically found in track lighting. Custom designs are available &###xA0;to orchestrate the "look and feel" you desire. Each piece will be inspected upon receipt to determine condition and validity of return. All pieces are limited editions based on the original piece. Sculptor, Jon Allen, developed his passion for structural minimalism at an early age. His exposure to famous architecture, museums, and galleries around the world, has provided influence and inspiration for his design aesthetic. A graduate of the Ft.	Lauderdale Art Institute of Design, Jon Allen built on the core foundations of materials and industrial processes; mastering the fusion and fluidity of geo-organic shapes with a solid contemporary edge. Through his composition, Jon Allen captures his audience with an explosive collision of spellbinding pattern complexity and modern simplicity. An accomplished artist, who possesses a keen eye for harmonizing order, balance, and elegance, his accolades include memberships in juried art communities, guilds, and associations, and has placed artwork in over 200 galleries, in the United States alone. Through his company, Statements2000, Jon Allen continues to exhibit his award-winning collections domestically, and has expanded to the international scene. Having perfected various design techniques, Jon Allen applies multi-dynamic compositions to highly reflective metals, to create the signature "WOW" factor. His limited series of original, fine art sculptures are displayed worldwide, from the corporate halls of Manhattan, NY, to the exclusive estates of Manchester, UK. Jon's inspiration is at the intersection of architecture and art. He loves clean lines and modern, contemporary art. His passion&###xA0;initially lead him to hand-making highly structural, architectural jewelry. He and his wife, with two young kids in tow, participated in art shows across the country. Today, Jon is revered as an innovator in the metal art realm. His work is well respected, often imitated but never replicated. His command over his chosen medium, metal, is unparalleled. S studio, you would guess you were seeing the work of no fewer than ten artists, each of whom had dedicated an entire lifetime to&##xA0. How could one person so masterfully&##xA0. &###xA0;an ethereal painting of an exotic jellyfish with electric tentacles that looks as though it were painted on glass&###xA0; and &###xA0;an abstract portrait that is evocative of Picasso? Surely not the same artist who just completed an art deco wall sculpture or&##xA0. But you would guess wrong. Jon Allen's unique handmade artwork is enjoyed by collectors all around the world. Each piece is handmade at Jon's South Florida art studio called&##xA0. 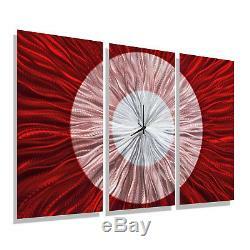 The item "Statements2000 Metal Wall Clock Art Panels Red Silver Modern Decor by Jon Allen" is in sale since Friday, October 28, 2011. This item is in the category "Home & Garden\Home Décor\Clocks\Wall Clocks". The seller is "statements2000" and is located in West Palm Beach, Florida. This item can be shipped worldwide.